Assuming you’ve put in the required training and tapered down during the last week, when race day itself comes around there are only really a few things that can influence your performance in the series. Three of those under your direct control are pacing, nutrition and hydration. As the Official Hydration Partner of Maverick Race, our job at Precision Hydration is to help you make sure you get that last one right so you can perform at your best on the day. To do that, we’ve built a free Trail Running Sweat Test that'll help you personalise your hydration strategy and tailor it to your Maverick Race. It'll help you better apply the more general advice below to your own unique situation in both training and races. Personalising your hydration strategy is crucial because everyone loses a different amount of sodium in their sweat (from about 200mg of sodium per litre to as much as 2,000mg/l) and, when combined with differing sweat rates, net losses can vary dramatically from athlete to athlete. Sodium helps you maintain blood plasma volume, which reduces cardiovascular strain and helps you avoid fatigue. It can also help you avoid cramp. The test takes 2 minutes and could significantly improve your performance. Ok, so let’s dive in and cover some of the general principles for staying hydrated during races. That often means hydration isn’t the first thing on your mind, but it doesn’t have to be scorching for hydration issues to ruin your race. Low temperatures can present issues of their own, such as the fact that the cold can make you need to pee more, which can result in you flushing out crucial electrolytes. So, your hydration strategy needs to be on point if you’re going to perform at your best when you set off from any start line during the Maverick Race series. Whether you're doing the short, middle or long distance race, you'll want to be stood on the start line optimally hydrated. Most runners think pre-race fluid intake is all about one thing; avoiding dehydration. This is understandable as dehydration can, of course, derail your performance. But, dehydration should not be your only concern as there's a bigger picture to consider. There's a huge temptation to drink a lot before a race. But you need to remember that human beings are not camels, we can't store vast quantities of fluid for use later on. Once you're fully hydrated your body has to start ditching excess fluid by peeing it out. Many athletes believe peeing a lot is a good thing because we’ve been told that producing clear urine in large quantities is a sign of ‘good hydration'. The reality is that over-drinking can actually cause you to start a race with your blood electrolyte levels diluted and maybe even with a lot of fluid sloshing around in your stomach or bladder. All of which are unlikely to help you race well. This is especially a risk if you’re just guzzling plain water or weak sports drinks. The best way to keep fluids in your body (and more specifically in your bloodstream) is to add a relatively large amount of one key electrolyte - sodium - to the drinks that you take in the day or so before a race. More on that here. Adding additional sodium to your pre-race drink helps you absorb and hold fluid in your blood stream, temporarily increasing the overall volume of blood you have on board whilst reducing the amount of water you need to pee out. This means you have a bigger reservoir of fluids to draw on once the race begins and you start sweating some of it out. • Drink 1 x 1,500mg/l electrolyte drink in 500ml of water (you’d have drank anyway) a few hours before the start. • Finish your drink at least 45 minutes before you set off to give your body time to fully absorb what it needs and remove any excess. • DON’T just drink lots of water in the build-up to the race. You can end up diluting your body’s sodium levels before you start, increasing the risk of hyponatremia. • Having more blood makes it easier for your cardiovascular system to meet the competing demands of cooling you down and delivering oxygen to your muscles. • Drinks containing >1,500mg of sodium per litre are very effective for pre-race hydration as they contain at least 3x more sodium than a typical sports drink. The short routes will vary between 5km & 8Km. When racing this kind of distance, the vast majority of athletes can comfortably go without drinking much, if anything, at all during the race itself (especially if you’ve preloaded before the start). If you’re really concerned about getting round without a drink then maybe take a small handheld bottle with you at most, but in all honesty carrying drinks in such short races is almost always unnecessary. At the finish line there’ll be plenty of Precision Hydration drinks to quench your thirst alongside that hard earned can of Maverick Race Trail Ale that’ll taste even better with the day’s challenge well and truly out of the way! The middle distance routes in the series can range from 15-18Km and, given the nature of the terrain, it’ll likely take the majority of runners well over an hour to complete it. Racing for 60-90 minutes or so is right around the threshold for when drinking during the race definitely starts to be necessary to maintain your performance, especially if it’s warm and/or you’ve got a high sweat rate. This means that some of the faster competitors in the middle distance race may well finish without drinking anything at all, whilst some will definitely want to have a decent drink on the way round. 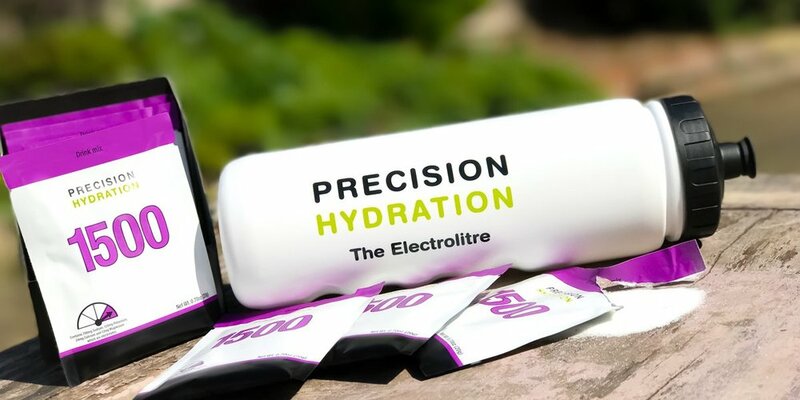 If you’re intending to carry your own drink with you on the middle distance route, we’d recommend having electrolyte supplements in your bottles or hydration pack. Doing the online Sweat Test will give you an idea of which strength electrolyte drink is right for you and you can get 15% off your first order using the code MAVERICK15. However, in most cases we’d question the wisdom of carrying a drink in races of this length, as there’s an Outpost en route where you can just grab some PH 1000 (which contains 1,000mg of sodium per litre, making it twice as strong as many electrolyte drinks you’ll have tried) or water as you pass by. This obviously saves you from having to carry your own drinks, which can slow you down. When you’re racing for more than 2 hours, as will be the case for most competitors on the long route, some level of fluid intake is almost definitely required to maintain your performance, especially in the later stages. If you’re intending to carry your own drinks with you, we’d recommend having electrolyte supplements in your bottles or hydration pack. Doing the online Sweat Test will give you an idea of which strength electrolyte drink is right for you and you can get 15% off your first order using the code MAVERICK15. If you’re aiming to travel light and not carry any drinks (as many of the faster runners will no doubt opt for), then both water and PH 1000 will be available at the 2 Outposts on the route and the one at the finish line. If you’re someone who sweats a lot, or if you’ve often suffered with cramp in the past during longer events, you might want to consider carrying some blister-packed SweatSalt Capsules around with you too. One or two of these can be washed down with water or the PH 1000 at the outposts and this is a convenient way to get some extra electrolytes in on the move. Read this blog for more on how to avoid cramping up. How much should you be drinking on the middle/long routes? • Listen to your body and respond to the early signs of thirst to decide if you need to drink. • It’s not wise to force fluids in if you don’t feel like you want them, but nor is it a good idea to wait until you’re really thirsty before you start drinking. • The main signs you’ll get if you’re not drinking enough are thirst and a dry mouth. • As a rule of thumb, few runners can comfortably drink a lot more than 750ml (24oz) per hour, especially when running hard, so unless experience tells you otherwise it’s unlikely you’ll want or need to drink more than that (especially if you got to the line well hydrated in the first place). • Signs you’re drinking too much are that you might feel bloated and full, can sense fluid sloshing around in your stomach, or you need to pee during the race (this shouldn’t normally be necessary during running races lasting less than about 4 hours). Experimenting within these guidelines whilst learning to listen to your body is the best way to find out how much you need to take onboard. So, that’s your hydration briefing for the Maverick inov-8 Original series. If you have any questions at all about hydration going forwards, let us know at hello@precisionhydration.com and we’ll be happy to help. Plus, don’t forget to use the code MAVERICK15 if you do decide to pick up some Precision Hydration for before, during or after you Maverick race.